Leonard Cohen and wine. Despite the fact that in recent years, Leonard seems to have curbed (or entirely eliminated) his consumption of fine wine, there’s still something that makes the two oddly synonymous (for me, at least). 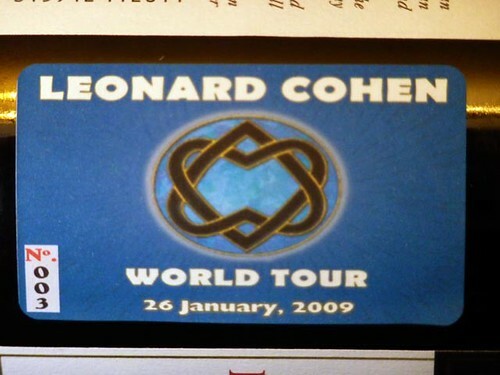 One notable reason for this association has got to be the several truly magnificent (some have said “spiritual”) performances that Leonard gave in Australian wineries during the 2009 tour. Those were exquisite and memorable performances (I saw three: McLaren Vale, Hunter Valley and Bowral). 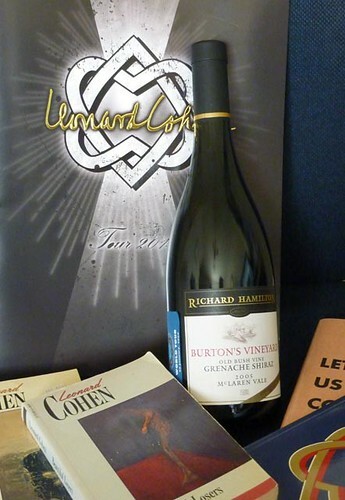 As an appreciator of good wine, at the time of the ’09 tour I created for myself a special “limited edition” souvenir collection of LC commemorative wine. Basically I jumped online, went to the websites for the five wineries which hosted Leonard’s “Day on the Green” concerts and bought myself a few bottles of their better wine. I even made up some neat home-made labels for the bottles. Since January 2009, these bottles have been sitting in (what I laughingly refer to as) my cellar … just silently calling out to be opened. I’ve resisted temptation so far (literally fighting against the bottles :-)). But tonight … with the final show of the 3-year world tour just about to wrap up, I reckon it’s time for the first unbottling. This entry was posted in Meta Info, Non-Concert Photos. Bookmark the permalink.